When November rolls around (no pun intended) I don’t dream about snow, turkey dinner and holiday parties. I get excited for another season of college basketball. To be more specific, Georgetown University men’s basketball. We have been season ticket holders for 15 years. And, even more special, my first date with Tony (my husband) was a Georgetown men’s basketball game. basketball. Before my accident, I played basketball. I wasn’t the greatest on the court, but I played with energy and grit. I was tough on the court and my coach taught me many lessons in life. His motto was “mental toughness” when we thought we were at our wits end from running up and down the court until he blew the whistle. Little did he know that his motto would get me through many difficult episodes later in life. My sister, 15 years older than me, moved to the Washington DC area. We would visit her and on occasion, attended Georgetown basketball games. Those were the years of Patrick Ewing and I became an addicted fan. After college, I attended law school at Georgetown (not just because of the basketball team, although that was an added bonus!). My apartment on campus was right underneath Dikembe Mutombo’s and I would frequently see Alonzo Mourning. Glory days. One of the biggest blows of my spinal cord injury was that I could no longer play sports, especially basketball. I had to find an outlet for my energy. Instead of being angry, I reinvented my playing ability into a loud, yelling spectator. Many curse words were learned watching basketball with my father. I have continued the tradition, but have tempered my yelling, although there are exceptions such as games that go into overtime or game against a rival opponent. 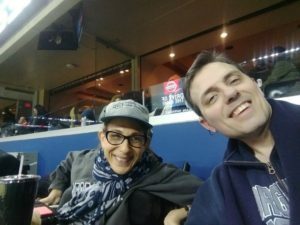 We have great wheelchair accessible seats at Capital One Arena (where Georgetown plays) and we look forward to our outings on the Metro to sit with friends in our section. At the games I forget that I can’t play. I am caught up in each moment watching all of the action. And I don’t just watch in person. I am a loyal basketball watcher of teams on TV and during March Madness I become a basketball fanatic. 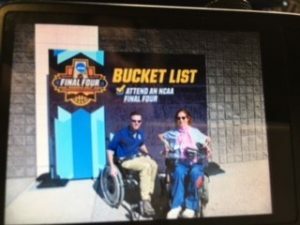 One of my best bucket list memories is going to the Final Four in Phoenix in April 2017. I am proud of myself for reinventing a passion. I can’t play basketball, but I can put that energy toward a positive purpose and find enjoyment instead of anger. And that is a fact of life for many people that have a passion that they enjoy and for some reason out of their control they can no longer engage in that activity. My theory is that life will bring many opportunities for reinvention. It is up to each person to choose anger or to another way to fill the void (reinvention). I choose the latter. Go Hoyas!